The Mare’s Tale . . . The popular names attached to common wildflowers are occasionally less than flattering. Disgruntled farmers and frustrated gardeners appear to have coined the names of several species. One good example goes by the “nom de bloom” of Horseweed: a native annual, rarely if ever seriously considered or appreciated, which almost everyone has seen growing beside the road or sidewalk. Here is a story about Horseweed; a plant that has the less frequently used, yet more attractive, equine name of Mare’s Tail. 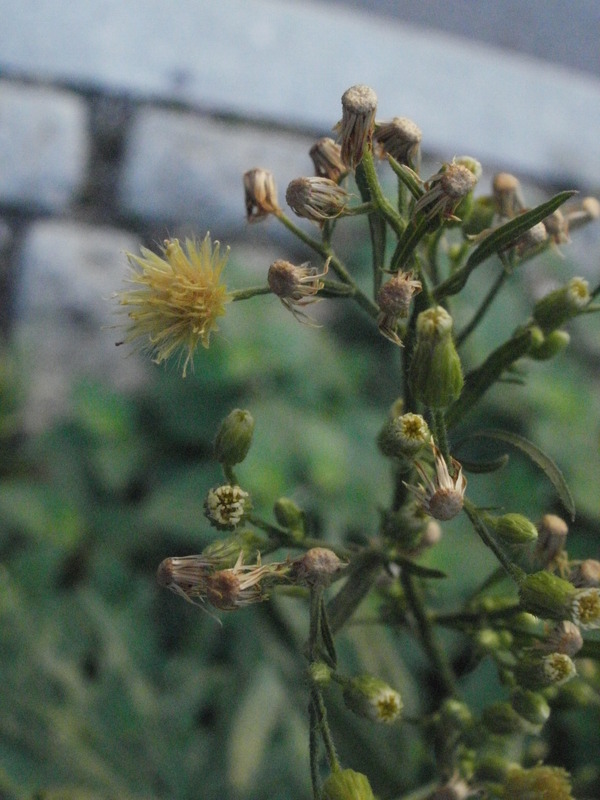 Conyza canadensis, as Mare’s Tail is known in the Latin, is another late summer and autumn representative of the vast Asteraceae family and more closely resembles the immigrant Fleabanes than the native Asters. Mare’s Tail has a ubiquitous distribution in North America and an inconspicuous flower; a combination that has kept it under the wildflower radar. Most appreciated species are often the rare or the showy. Mare’s Tail is one species that has actually emigrated to become established in Europe. The reason for this stems from its medicinal properties. Eighteenth century doctors were introduced to the plant by Native Americans and its seed was sent to England and France. The oil derived from the plant, called oil of Erigeron, was found to slow bleeding and serve as a useful medicine for that common ailment the British call piles. Mare’s Tail is still cultivated commercially here in the United States. Major production is centered in the states of Michigan and Indiana, and oil of Erigeron is available for purchase online from several herb purveyors. The plant itself is a late bloomer of sorts. Mare’s Tail sprouts from seed and anchors itself with a shallow taproot. 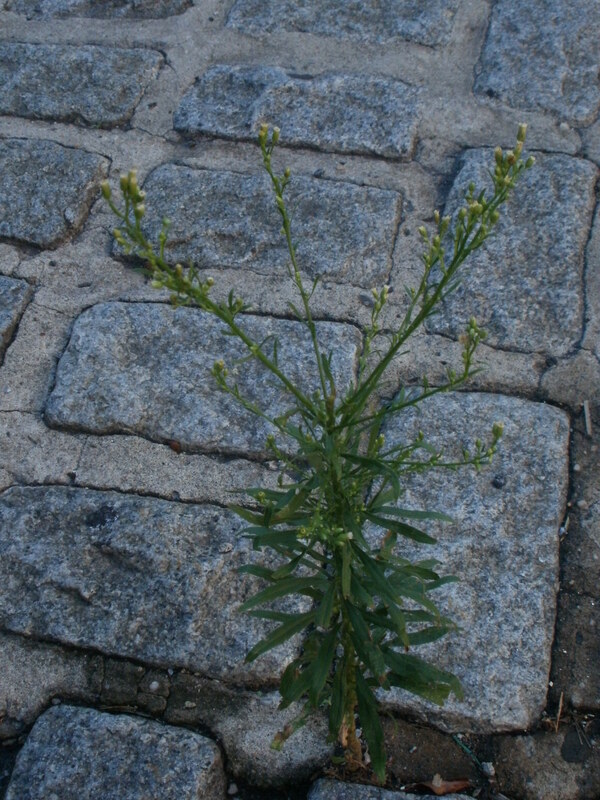 The young plant begins as a basal rosette that rises on a straight hairy stem, which carries a very busy alternating series of serrated lanceoalate leaves. Before the plant flowers it resembles a living, green, upright Christmas garland. Dozens, if not hundreds, of these deep green boughs varying between two and eight feet in height will line a section of road or fill a vacant lot. The festive theme can be used to describe the mature plant as well. The flowering phase, viewed with a little imagination, gives the Mare’s Tail a pointed silhouette that looks as much like a Christmas tree as a horse’s caudal appendage. The tiny flowers are colored a modest off-white and go to seed in the manner of most daisies: a sphere of pale parachutes; miniature ornamental balls hanging at intervals along the extended boughs. 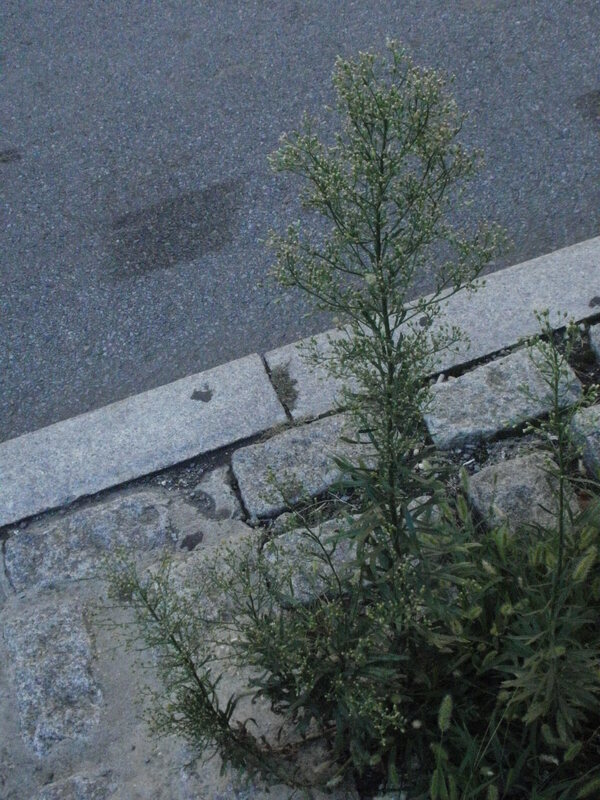 Mare’s Tail, Horseweed, perhaps even Christmas Weed: whatever name sticks, it is also one of the Wildflowers of the West Village.